Sometimes you just need bread. I often get this urge to knead, to mix, and to fill my house with the warm, sweet/savory smell of baked bread (one of the best, most comforting smells ever). Not to mention the drool-worthy thought of a fresh, crunchy crust. Now, knowing that most gluten strains give me terrible tummy aches -- caused by the highly modified emmer-derived wheat variety called dwarf wheat, which is now used the world over -- I can't eat normal bread. That's right, that image of the waft of steam that rises up out of the new loaf of wheat bread to lure me into the kitchen is no more. Well, kind of. teff, tapioca, millet, amaranth, corn meal, & quinoa. And soon I'll be experimenting with a very old variety of wheat called einkorn, which is pretty much magical and soon to be really popular the world over. Why? It's high in protein, tastes like a full, whole wheat bread, and doesn't cause issues for gluten-sensitive people. I'll go into why that is in a different post. Mr. B (the boyfriend) and I are going gluten-free simultaneously. I wouldn't say that it's been hard, at least not for me, but it definitely hasn't been easy. Part of that has to do with the many, many times I have tried and failed to go without gluten (I'll go without for a couple of days, but then someone offers me a bbq gardien 'chicken' nugget and ... I'm weak). So this time, after some of the most extreme stomach aches (not to mention overall digestive weariness) I've had so far, I am convinced. I've also dramatically reduced my sugar intake, which helps with the tummy aches. Presumably, this has something to do with an overgrowth of candida yeast (a naturally occurring yeast in the system), a die-off of positive probiotics, and a gluten sensitivity. A hippie woman I work with tells me that I can't eat as many inflammatory things because "my consciousness is rising so fast." I guess what she means is that my awareness/sensitivity to the energetics of the world is developing so quickly that my body is starting to become very sensitive as well. At the very least, it's interesting to think about our bodies in that way: attuned to our mental state. Mr. B has it harder. He works at a nice restaurant with delicious, freshly made Mediterranean dishes all around him, including something called a fatteyah -- basically a thin-crust pizza with different spreads baked onto it (like muhummarah, feta & peppers, spicy eggplant, etc.). And he basically gets free vegan baklava, mamool, etc. He's been getting headaches since he stopped eating wheat (a result of detoxing from the opioid-alighting exorphins available directly from the blood-stream after consuming wheat products). So we're upping his melatonin at night so that melatonin doesn't interfere with his serotonin production during the day. Overall he's feeling super clear and aware. Luckily, my parents are gluten free and so many people and companies are becoming aware of the gluten-sensitive population. Trader Joe's, for example, has a fairly good amount of gluten free products, including gluten free oats (which I used in today's post). 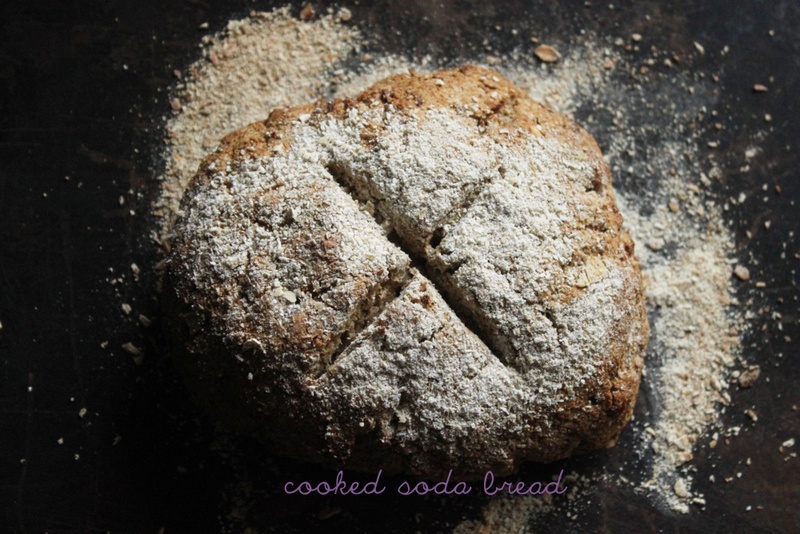 It was a bright morning when I made this oat soda bread. I woke up with that baking urge in my head. It's like a little baker version of your consciousness on your shoulder (you know, the whole angel/devil on your shoulder visual) with a teeny tiny baker's hat and the littlest, most adorable apron you've ever seen. And that tiny baker is whispering, (in a french accent) "BONMATIN! Wake up the sleepy head! You are going to make zee delicious bread zis morning wis your large, big person hands! Zee hands large enough to mix some ingredients together! Wis your giant mammoth spoons! Oui, make me some breakfast with zee golden crust. EET WILL BE DELICIOUS." And, since your consciousness is French and very bossy, you do it. 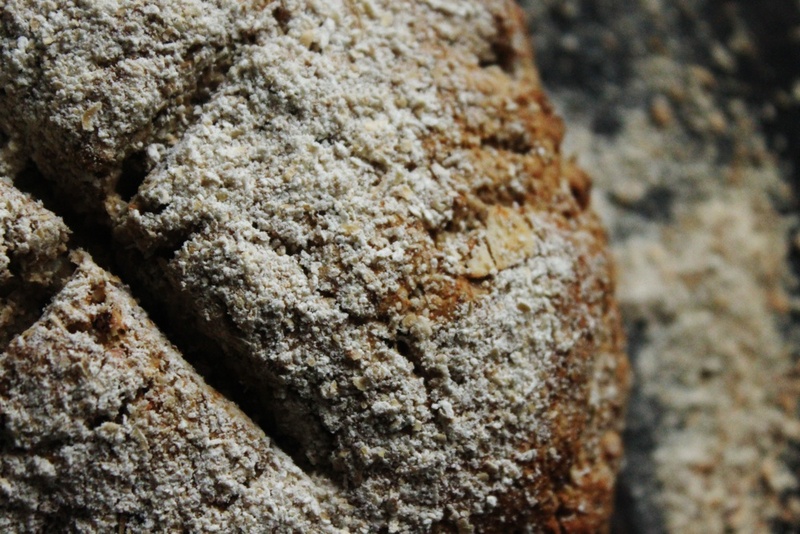 Soda bread is both sweet and salty, usually filled with currants and caraway. I find caraway to be a bit of an acquired taste, however. And I don't really enjoy the celery-like bite of the spice. I substitute cardamom in my version of gluten-free soda bread; incidentally, cardamom and caraway have similar health benefits, including aiding with stomach cramps and digestion. However, cardamom is considered a warming spice, though tri-doshic (balancing to all of the ayurvedic body types) whereas caraway is a cooling spice (great for pitta types, bad for kapha, and ok for vatta) similar to anise. I also add some chocolate. Because I can. 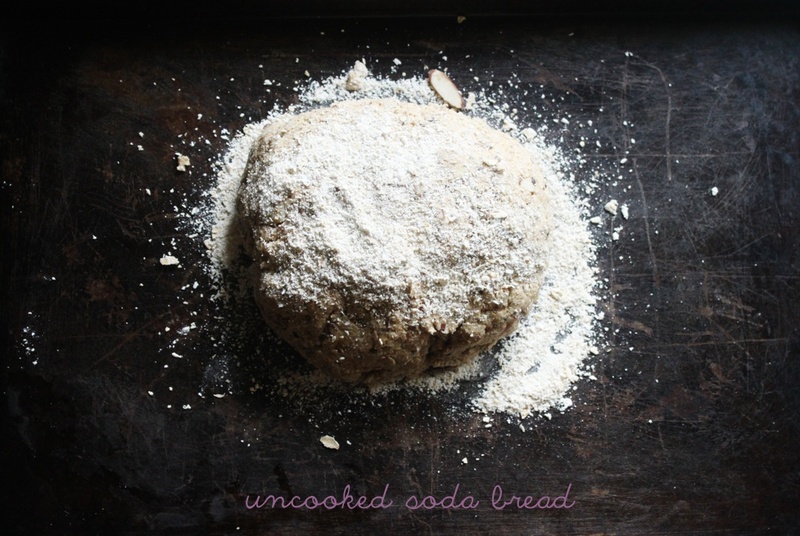 This soda bread is adapted from Babycakes Covers the Classics by Erin McKenna. Mill your oat flour if necessary. In a little bowl, mix the almond milk, chia seeds, and apple cider vinegar. This is both your "buttermilk" -- which will activate the baking soda in the recipe -- and your egg. Set aside. In a medium bowl, combine 3 & 1/4 cups of oat flour (reserving the remaining 1/4 cup to dust the pan and loaf before baking) and the rest of the dry ingredients: cardamom, cherries, chocolate chips, almonds, baking powder, baking soda, xanthan gum, salt. Mix with a spatula, or with your hands if you like to get into it like me. Melt your coconut oil. All I ask of thee is that you NOT put it in the microwave. Just... melt it with your mind. Or with your stove. Or hot water. Mix coconut oil with the dry ingredients. Now, take the bowl of chia, almond milk, and vinegar "buttermilk"/egg and add it in. Mix thoroughly. The batter should be slightly sticky & holding together. If you really can't get the oat flour incorporated after a minute of mixing, add just a tad of almond milk. A tad I said, then mix again. Form the dough into a ball with your hands. Dust your baking pan with the reserved oat flour. Place your loaf of dough onto the pan. (If your hands are covered in sticky dough, your mixture is too wet. Add more oat flour and knead it in.) Sprinkle the loaf with oat flour. Cut an X 1/4 inches deep into the top of the loaf. Put your loaf into the oven. Cook for 20 minutes, spin your pan around 180 degrees, then cook for another 20 minutes. Your soda bread is done when the crust is golden and when a knife inserted in the center comes out clean. Let cool 15 minutes when it's done. Or just start gnawing on it immediately and burn your mouth due to insufferable impatience. Like me. Cut and serve with some tasty jam. BLUEBERRY IS KING. Ok... blackberry is acceptable.